Today I have a review out of the polish AND beauty norm. But, I'm putting this in my blawg because it's something we all can relate to! Chores! More specifically, evil, EVILLLL, dirty dishes. 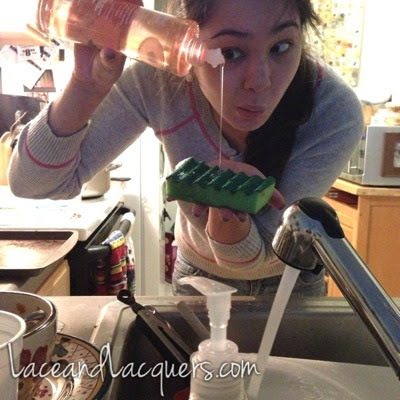 After the jump I have a review of a dish soap by Palmolive from their Fresh Infusions line. (yes I have two #3s haha) But the crap has to get done! Sadly, I'm not rich and I have no one to do the dishes for me :[ or the laundry haha. And thankfully, I don't have to deal with maggots or else I'd die. Palmolive Fresh Infusions scents are said inspired by nature, fresh scents and simplicity. Besides the lemon and lime, the Ginger White Tea was one scent I don't recall seeing whenever I buy dish soap... and the lemon and lime ones I see usually aren't mixed with herbal scents. I love the smell of fresh herbs, so that was exciting too! 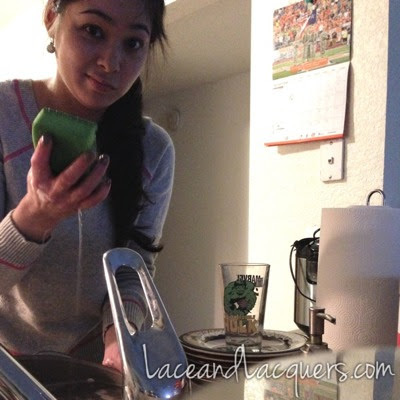 I usually look a lot more pissed off when doing dishes, promise haha. My favorite was the Ginger White Tea. If you've smelled The Body Shop's Ginger Sparkle line from the holidays, it smells a LOT like that... a spicy, ginger scent without the bakery notes. I didn't smell white tea however, I have no idea what white tea smells like LOL But, I didn't smell any sort of tea? The Lemon Thyme and Lime Basil were a little bit of a let down. There was a good part about these though! Whenever I see a citrus cleaning product, I assume they all smell that citrus, blah, cleaner smell. You know what I mean? However, these didn't! The lemon smelled more like an actual lemon than a lemon cleaner. I didn't smell any Thyme, which made me a sad panda. The lime was probably my least favorite. It didn't smell like citrus cleaner... but more like lime jello lmao. I didn't smell any basil either :[ which made me sad because it's one of my favorite cooking herbs. If you're looking for a dish soap and you're super focused on the scent, I'd say these are the products for you! They do smell really nice in comparison to other dish soaps. Other than that, I don't find anything special about them - Sorry, Palmolive! 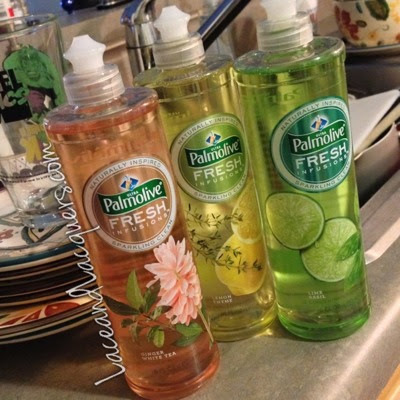 You can find Palmolive Fresh Infusions at Walmart or Target (currently) at $2.99 for a 16 oz bottle. The link I provided also has a product finder if you'd like to check before you make the trip! 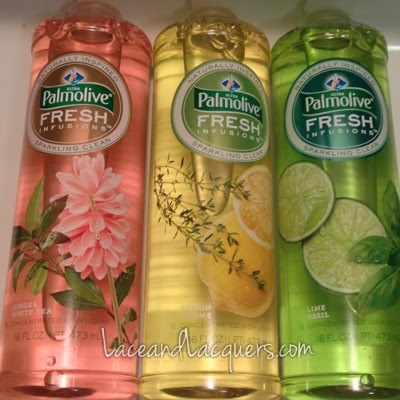 Also check out the Palmolive Fresh Infusions Influenster page for more reviews! OMG I hate doing dishes, too!! *dies* I always wear gloves because I make the water super hot (to punish the dishes :p) so I don't waste my money on mosturizing soap anyways. Always looking for nice scents, though. I'll have to keep my eyes open for these. 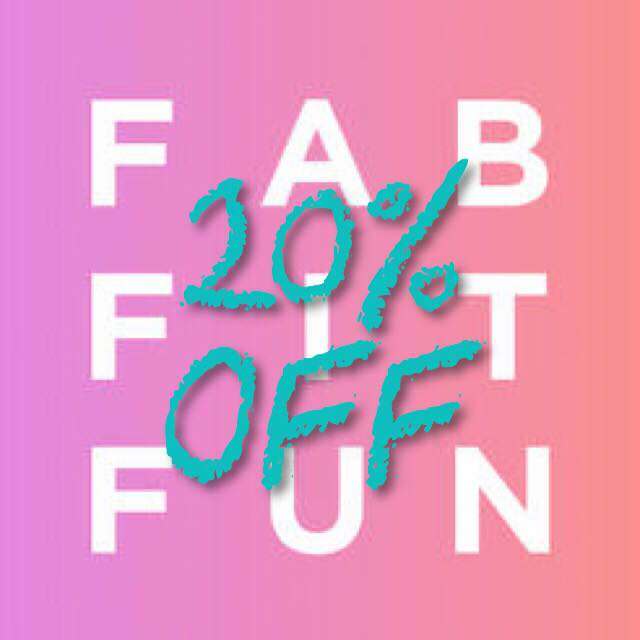 haha.. love the funny face! !